This post is the first in a series about the history of the Academy, appearing weekly for the duration of our First Ever Capital Campaign. 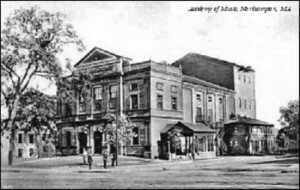 As excited as we are about the prospect of restoring the Academy to its 19th-century grandeur, imagine how excited the Northampton community was in 1889, when plans for a state-of-the-art opera house were first announced. Today, our lighting is still state-of-the-art. If only Edison could see it! Help restore the Academy! We’re replacing the seats in the auditorium, repairing and repainting the ornate plaster, insulating and replacing the stage roof, and adding aisle lighting. Learn more.